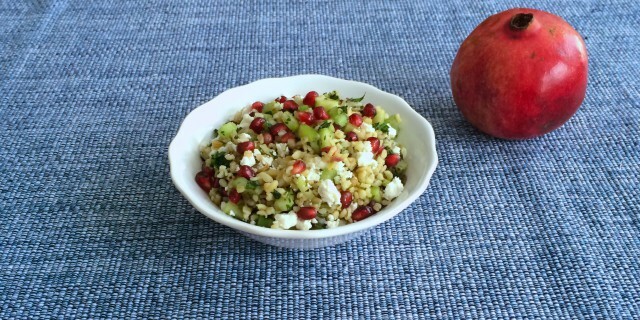 This Pomegranate Bulgur Salad with salted ricotta is a tasty light meal for a summer evening, picnic or potluck. It’s not just a very delicious and refreshing meal on a hot summer evening but it’s also a party for the eye with all the bright colours and different textures. The snow-white colour of the salted ricotta strikingly stands out in the salad against the vivid green colour of the fresh herbs, the pink-red color of the pomegranate seeds and the light green colour of the cucumber and celery. In terms of flavour, the sweetness of the pomegranates and dates contrast beautifully with the salty crumbly ricotta and the nutty bulgur. If you are not used to using ricotta in your salads, look for ricotta stagionata or ricotta insalata. It’s not the fresh one you use for desserts but a mature sheep’s milk ricotta that is salted and which you can find in the aged cheese selection. It has a light, refreshing taste, a dry, crumbly texture, but will melt in your mouth on your first bite. In a large saucepan, toast bulgur over medium heat for 2 or 3 minutes. Add 2 cups of water. Bring up to a boil, lower heat and allow to simmer until cooked, for 18-20 minutes. Rinse and set aside to cool down. Mix the dressing ingredients in a small bowl. Add all salad ingredients, except for the ricotta, to a large salad bowl. Mix in the bulgur and sprinkle the dressing on top. Serve with crumbled ricotta stagionata. My mission is simple. I want to help ambitious people to create a life that deeply matters to them. I do this work because I love helping people. I believe that we all have incredible gifts to share. I want to amplify the good in you and help you achieve positive, lasting change and behavior; for yourself, your people and the world around you. In my years of coaching, I have helped many coaching clients overcome limiting beliefs and behaviors to greater fulfillment. I have seen the lives of my clients shift in such positive and profound ways when they started to build their lives around their personal values, strengths, passions and joys in life. As a coach, I help people understand how your beliefs and the environments you operate in can trigger self-defeating behaviors. I help people develop their gifts and leverage their natural strengths to achieve greater success and fulfillment. Through simple steps I help people build and sustain a more meaningful life. Copyright © 2012 Chantal Soeters, All rights reserved.